Pebble Beach is on the coast just north of Bean Hollow State Beach. Come for the pebbles, stay for the rocks. It was a weekday the last time I visited Pebble Beach, on the San Mateo coast just south of Pescadero, and several busloads of children came and went. They flocked to the pebbles, flung them high, and were off in their buses 15 minutes later leaving the beach to me. I did the same here when I was a kid, and you can too—the pebbles are wonderful—but I can show you a better time today. Pebble Beach (also called Bean Hollow Beach North) is a great place to look at the deep sea floor without getting your feet wet. The rocks exposed there are scrubbed clean by surf and nicely tipped up on edge for easy viewing, and they present many instructive mysteries that students actually pay professors and buy textbooks to learn. But first, about the pebbles. You get to the beach on Route 1 going south from San Gregorio Beach, which skirts the coast on flat land that is largely planted to artichokes and ranchettes. This tableland is a marine terrace or wave-cut platform. See the setting in the photo below, from the California Coastal Records Project. The San Mateo coast is famous for these terraces, especially down around Santa Cruz. They are land that was cut flat by the sea during the Pleistocene epoch, then lifted by tectonic activity. The terraces consist of beach sand and offshore sediment from tens of thousands of years ago, and most of the pebbles of Pebble Beach are recycled from that Pleistocene gravel. Pebble Beach is right where the symbol that says “63” is. 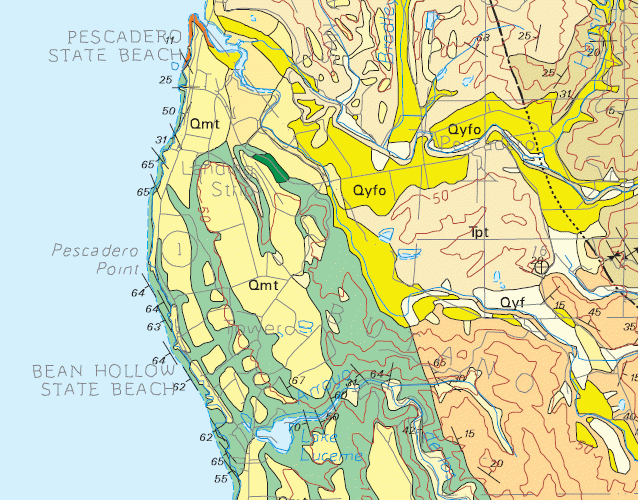 The areas marked “Qmt” are the marine terraces. If you examine the red contours, which show elevation at 50-meter intervals, you’ll see that the terraces occupy at least three different levels. 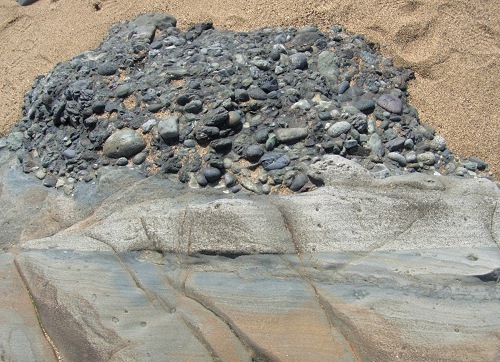 The rocks on the beach, revealed as the terrace is eroded away, are mapped in green and belong to the Pigeon Point Formation, a thick pile of former deep-sea sediments dating from the Late Cretaceous epoch, some time between 100 and 65 million years ago. That “63” symbol means that the beds of rock, originally horizontal, are tilted to an angle of 63 degrees. 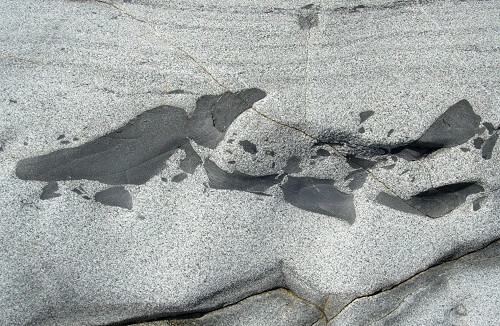 And here they are, exposed again just as the sea left them in the Pleistocene. The surface between the steeply dipping rocks and the horizontally bedded terrace deposits is called an angular unconformity. In this case it represents a gap in time of at least 65 million years. The next five photos are cross-section views, shot looking directly down that 63-degree angle at the rocks. Here’s where fine-grained siltstone, light-colored sandstone and cobblestone conglomerate are stacked. 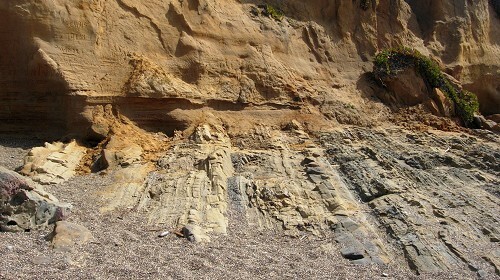 There’s another angular unconformity between the siltstone and sandstone. 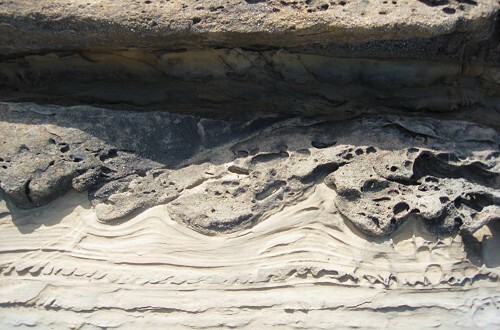 And look at the wavy top surface of the sandstone—the conglomerate clearly arrived in a rush, pushing into the sandstone while it was still loose sand. 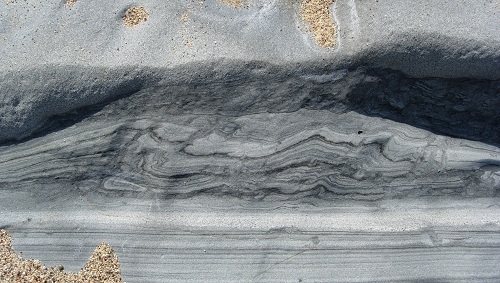 This was a very active environment, an offshore basin where large amounts of coarse sediment washed down periodically in underwater landslides. In fact, it was rather like offshore California today. 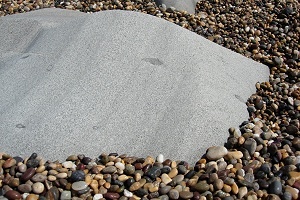 The many small stones embedded in these rocks were eroded free to become the gravel in the marine terrace. So the pebbles of Pebble Beach have been recycled two times, and maybe more. Too bad the schoolkids can’t stay all afternoon! But you can. This is our favorite beach along the San Mateo County coast (except when gray whales land there and decompose), thank you so much for the geological analysis! I’ve longed for a post just like this one. This is OUR favorite beach. We call it Secret Beach. SHHHHHHHHH!!!!!! One of my favorite beaches in the whole world, and for all the reasons Andrew described. Andrew – thanks for the post. As my wife already noted in a previous comment, San Mateo’s Pebble Beach is our family’s favorite local stretch of shoreline. Even on a cold day, as long as the sun is out, the colorful pebbles absorb quite a bit of heat and can be delightfully warm to lie upon. Always something of scientific interest to see there. 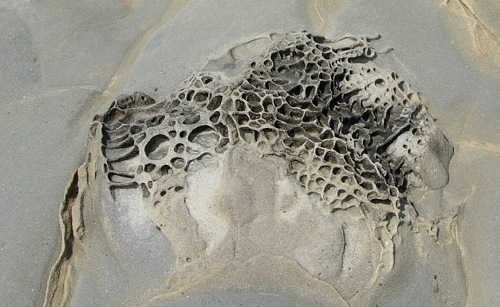 Regarding Tafoni, is it only sea air that can cause it? I’ve definitely seen examples farther inland (e.g. El Corte Madera OSP). Do the salt and other minerals from seawater contribute or is it merely marine moisture that is the culprit? Fantastic pictures and seem like a special place! It would have been really good if there was something showing scale on the photos I must say. 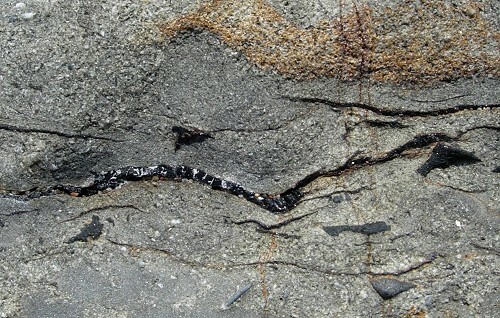 One of the fasinating things with geology- that the same phenomena can develop at such different scale.